The organisation formed in Melbourne, Australia, provides education through public awareness, specialising in street activism. Volunteers of the Anonymous for the Voiceless group in masks spreading the message for better animal care at Lautoka Sugar City Mall on April 13, 2019. A peaceful event promoting welfare of animals, environment and health was organised by the Anonymous for the Voiceless (AV) group at Sugar City Mall in Lautoka yesterday. AV International is an animal rights organisation that holds an abolitionist stance against animal exploitation and promotes a clear vegan message. 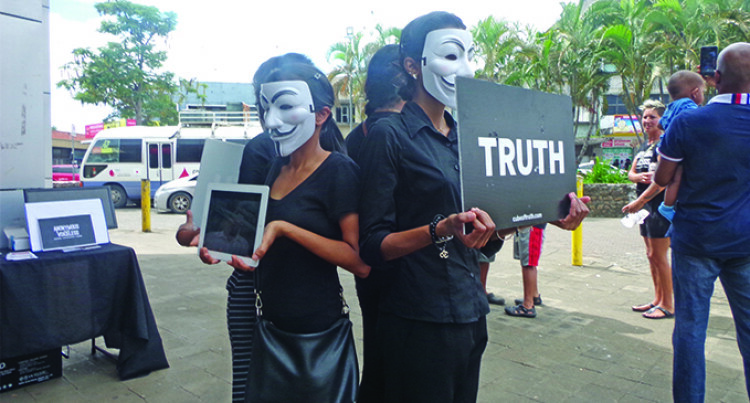 Anonymous for the Voiceless in Fiji organiser, Angie Aryaan, said they were an animal rights organisation that specialised in educating the public on animal exploitation and fostering highly effective activism communities worldwide. “We as an AV organisation are raising awareness around the world that animal abuse has to stop and Fiji is no exception,” she said. After witnessing animal abuse here in Fiji she had to approach the group to provide awareness here because animals feel pain just like humans would. “We have a poor treatment of animals, animals were not created for us, but with us,” she added. The activist behind the mask hold messages that people can read and understand the importance of animal welfare. The Greater Good Foundation and Animal Sanctuary Fiji, that provide care for abused dogs and cats, were at the street awareness to support the AV organisation.